If you’ve ever suffered from lower back pain you’ll know how uncomfortable and debilitating it can be. When you’re in pain you may not be able to move around as normal and you could be completely immobilized. Medication and physiotherapy may help and wearing a back belt can also be effective. 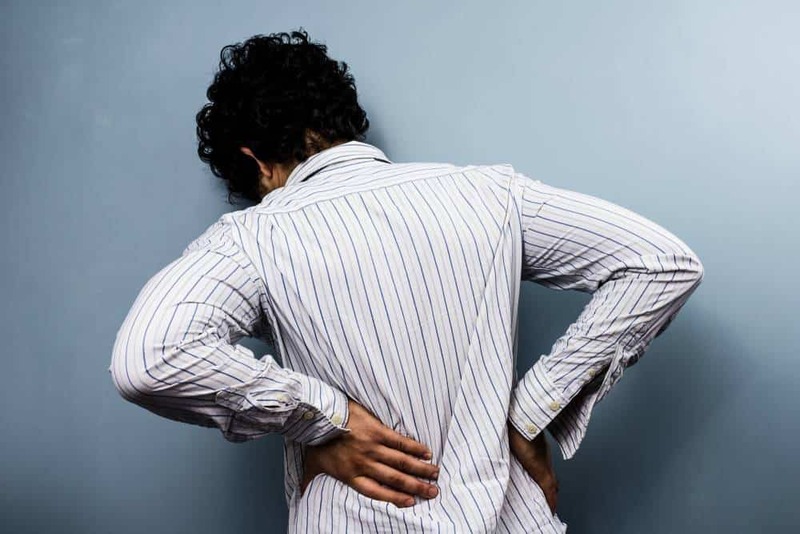 A study concluded that almost 20 percent of workplace injuries and absence from work is due to back problems. Many years ago I had a very physical occupation and suffered with lower back pain. After consulting my doctor I was told to wear a back belt to help with my recovery and I also wore it when working. A back belt isn’t going to cure the problem but wearing one has a number of benefits. Adjustable lumbar support back brace. 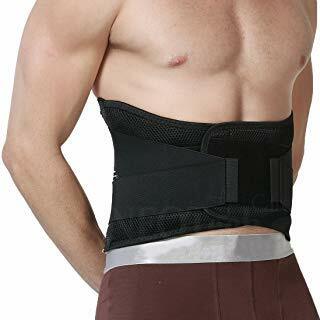 Adjustable back brace support belt. Mesh fabric with Velcro straps. Who Needs to Use a Back Belt? When you’re in pain due to a problem with your lower back you can wear a back belt to provide some pain relief. A back belt will keep your back straight as well as supporting the muscles whilst the injury heals. Protecting and supporting your back may help to speed up the healing process as well as easing your pain. If you’ve had back surgery you may also have to wear a back belt until the area that was operated on has healed. A belt will support the spine, muscles and soft tissue until you’ve recovered. As your surgery heals you can usually reduce the amount of time you wear the back belt for until you no longer need it. Even if you’ve never injured your back, or when a back injury has healed, you can still benefit from wearing a back belt. Wearing a decent back belt when lifting heavy objects or when doing strenuous tasks can protect your back. If you give your back some support you can help to prevent painful injuries. How Does a Back Belt Work? Most back belts are made from a lightweight fabric with rigid pieces of plastic, bone or steel inside. These rigid stabilizers help to keep the back straight and in the correct position. The belt wraps around the lower back and abdomen and it’s secured and adjusted with straps. Back belts also put some pressure on the abdomen which can counter the forces that are put on the spine. Balancing out the forces can help to prevent injury when lifting or doing strenuous activities. The pressure that’s put on the abdomen isn’t great but it’s enough to help to achieve a balance. Back belts also provide some compression which can promote healing following spinal or muscle damage. Compression improves blood flow so that enough oxygenated blood is delivered to the muscles. Compression also helps the flow of lymph fluid which delivers nutrients to damaged tissue and takes away cellular waste. A belt also encourages wearers to lift by bending the knees rather than bending the back. Bending the back can lead to serious spinal injuries and lifting correctly is important. When you’ve got into the habit of lifting correctly your muscles and brain may be trained to continue correct lifting methods. How Do I Choose a Back Belt? When you’re choosing a back belt it’s important to select one that fits well. Before you buy a back belt you should measure around the fullest part of your abdomen so that you order the correct size. Some people make the mistake of ordering a belt in their waist size but the belt doesn’t go around the waist. As well as making sure that your back brace is big enough to fit around your back and abdomen it’s important to ensure the straps are long enough. The straps need to be long enough so that they can be fastened. If the straps are too short you won’t be able to get the belt tight enough and it may slip. Choose a back belt that allows for some adjustment so that you get a more comfortable fit. Buying a back belt that can be adjusted will also allow you to alter the amount of compression. Your weight may also fluctuate and having an adjustable back belt allows for weight gain or loss. You should also make sure that you buy a brace that’s well made so it’s durable and functional. Good-quality fabric should be used to make the belt and the Velcro should stick. A poorly made back belt won’t provide adequate support and won’t last. Choose a back belt that’s easy to put on, take off and adjust without any help. Most of the back belts fasten at the front and these are easy to put on and take off. If you’re in pain due to a bad back you don’t want to be struggling to fit and adjust your back belt. It’s a good idea to look for a back belt that’s easy to keep clean by hand or machine washing. When you wear your belt for a period of time it’ll get dirty and may also retain perspiration. Keeping your belt clean will keep it in good condition and it’s also more hygenic. Buy a belt that fits well. Check the length of the straps. Choose a belt that’s adjustable. Buy a belt that’s well made and durable. Buy a belt that’s easy to put on. Use a belt that can be washed. 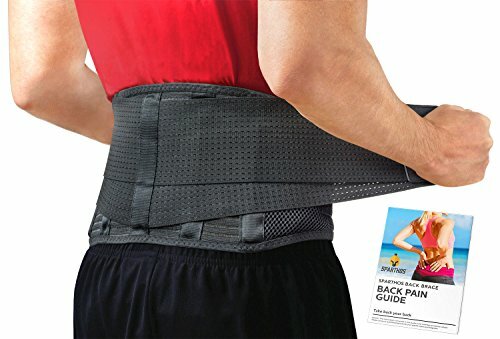 What Is the Best Back Belt for Back Pain? We looked at a number of back belts that are suitable for people who are suffering from different types of lower back pain. We were looking at quality, price, comfort and the support that each back belt provides. We’ve reviewed five back belts and listed some pros and cons for each one. 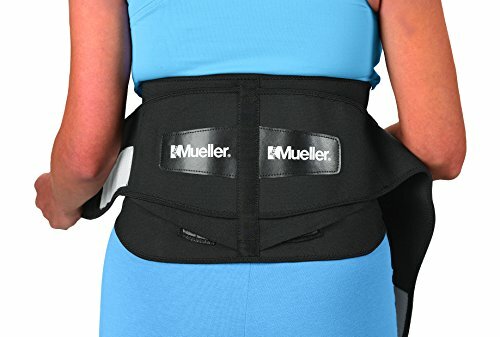 This lumbar support back brace made by Mueller is available in two sizes and has flexible steel supports to stabilize the lower back. The belt is made from a combination of polyester, rubber and nylon and it’s secured and adjusted with Velcro straps. The belt has a useful lumbar pad which is removable as well as steel springs that conform to the back. Customers who use this back belt say that it provides a good level of support and it alleviates some of their back pain. Customers were impressed with the quality of the belt and said that the Velcro holds well. People also said that the brace is very easy to put on and they like the amount of adjustment. 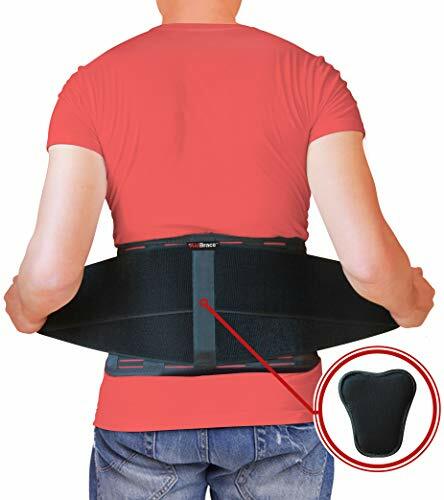 Other people who purchased this lumbar support brace said that the strap was too thick and it digs in to the abdomen. Customers felt that the brace is bulky and very heavy making it uncomfortable to wear. A number of customers also said they couldn’t get the brace to fit well and would’ve liked more size options. Easy to put on and adjust. The Neotech Care back brace is available in six sizes and it provides support and compression for the lower back. The brace is adjustable and has breathable side panels to keep you cool and dry. The brace features a double-wrap mechanism for maximum support and the belt is secured and adjusted with Velcro straps. People who purchased this brace were very impressed with the adjustment which they said was better than other belts they’d used. Customers also liked the width of the belt which makes it very comfortable to wear. People also said that when they’re wearing the belt their lower back pain is significantly reduced. Customers who used this back brace said that it was poorly made and the Velcro came away from the straps after a few weeks. Some customers said that the brace moved around too much and they had to keep refastening it. A few customers also said that the belt didn’t give them the lumbar support they were looking for. 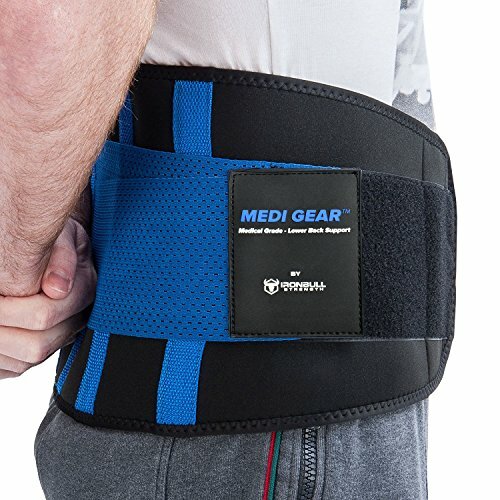 The Medi-Gear back brace is available in four sizes and it’s designed to support the lumbar region to keep the back straight. The belt is made from breathable neoprene and it has a Velcro strap to keep in place. The belt also has two straps to adjust it and is lightweight so it can be worn under clothing. Customers who used this belt like the fact that it wasn’t noticeable when worn under clothing. People also said that the belt has eased their lower back pain and it’s helped to correct their posture. Customers liked the fact that the belt is easy to put on and adjust without any help. Some customers who purchased this back belt sad that it tends to bunch up when they move around whilst wearing it. People also said that the stabilizing stays were a little flimsy and didn’t give enough support. Customers reported that the back belt is too soft and they would’ve preferred a more rigid belt. This back support belt by Sparthos is available in three sizes and has vertical stays to stabilize and support the back. The back belt is made from breathable mesh and it’s secured with a Velcro fastening strap. A good feature on this belt is the adjustable lumbar support pad which can be moved to a suitable position or removed. People who use this belt to help with lower back pain say that it’s effective and provides adequate support. Customers said that the belt is easy to put on and it stays in place throughout the day. Users also reported that the belt was comfortable to wear against the skin and the fabric didn’t make them sweat. Customers who purchased this back support belt also said that it’s too bulky and they’re unable to wear it under clothing. A couple of people claimed that the vertical stays pierced the back belts fabric after a few days. A few customers also said that the back belt didn’t provide the correct type of support. Support stays may pierce fabric. The back brace support belt by AidBrace is available in three sizes and is designed to support the lumbar region. The belt is made from a breathable mesh fabric and it’s secured and adjusted with Velcro fastening straps. The belt features a removable lumbar pad and has curved sides for added comfort. People who used this back belt said that it fits well and provides the lumbar support that they need. Customers liked the fact that this belt isn’t too bulky and it can be worn comfortably under clothing. A number of customers also said that the belt is easy to put on, take off and adjust. Other customers who purchased this back brace support belt said that the Velcro fastenings are poor and didn’t stick after a few weeks. A few customers said that when the belt is brand new it has an unpleasant odour. Some customers also reported that the back belt tends to move around too much which caused a skin irritation. All the back belts that we’ve reviewed are suitable for both men and women who are suffering from or trying to prevent back pain. All of the belts are of a similar design and are in the same price range. They offer a good level of support for the lower back and they’re all adjustable. After looking at each of the products the best back belt back pain is the Mueller 255 Lumbar Support Back Brace. This back belt is good value for money, it’s made from good-quality materials and the Velcro fastenings are secure. The back belt is also easy to put on, take off and adjust without help. We also liked the removable lumbar pad and the steel springs that provide some extra support. What is the Best Waist Trimmer Belt in 2019?